Sweden’s pepparkakor (pepper cake) is pfefferkuchen in Germany, speculaas to the Dutch, gingerbread to the British, and pain d’épices (spice bread) in France. Notice a theme? All are northern European, at the opposite end of the world from the tropical Pacific islands where the spices come from. And all of these cakes/breads/cookies use different spices and techniques. We’re going French with our Grist & Toll pain d’épices. Cinnamon predominates, followed by ginger, cardamom, and nutmeg. We also use long pepper, spicy with floral notes, available online and at some Whole Foods markets. Anything made with exotic, imported, and expensive ingredients must be good for you, so in the Middle Ages in Europe, spices had medicinal properties and were considered aids to digestion. Common folk had to settle for dosing themselves with remedies from their own herb gardens, but the wealthy headed to spicer-apothecaries, the local drug dealers who sold by the gram. It was all about humoral theory, the prevailing medical philosophy. That’s why recipes for spice cakes were not in cookbooks, but in medical manuscripts. Spices like cinnamon and ginger were hot and dry, so they could counteract the evils of wet and damp foods, like some meats, which could lead to a melancholy disposition and even death. Spice cakes contained sugar, also a medicine; doctors prescribed it for toothaches. Some of the medieval spice cakes were made of bread crumbs, brandy, and beer. Others were made from a rye-honey-spice dough that was mixed and then stashed in a cool place—no shortage of those in Northern Europe—and allowed to ferment for months. Most of these were hard, what Americans call gingerbread people or spice cookies. A major change, and much confusion, occurred in 1796, when Amelia Simmons became the first American to write a cookbook, American Cookery. Simmons had a recipe for “soft gingerbread baked in pans”—the first recipe for gingerbread as we know it. What made it modern was that it used a chemical leavener, the precursor of baking powder. Our pain d’épices uses baking powder, too, so you can whip it up in minutes instead of months. 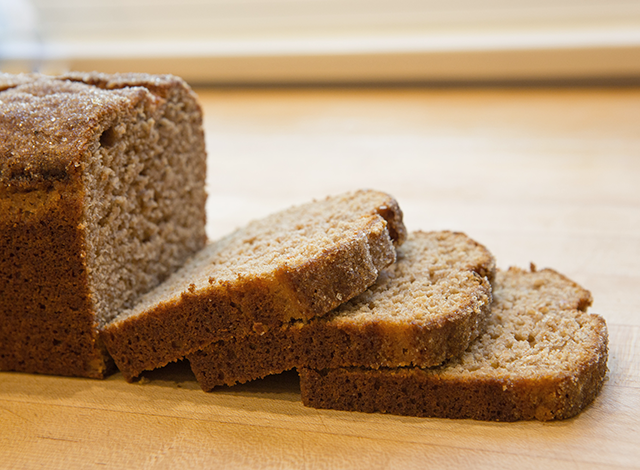 The most visible, fun form of spice bread is the gingerbread house. In 1812, the Brothers Grimm published their fairy tales, including Hansel and Gretel, and gingerbread houses became a thing. Hansel and Gretel were the children of a poor starving woodcutter who abandoned them deep in the woods. Unfortunately, this is based on reality. In the 18th century, poverty and famine were widespread, so when children turned ten and could function on their own, parents took them some place unfamiliar and left them. When Hansel and Gretel find a house “built of bread and covered with cakes,” with clear sugar candy windows, they start chowing down on it. Out pops a kindly old lady—really a witch—who has created the house so she can fatten children up and eat them. But Gretel outsmarts the witch, the children take the witch’s jewels and return home, and they all live happily ever after and are never hungry again. Good Health, Long Life, and Happy Holidays! Pain d’Epices is not as widely baked in American households as its relative, the gingerbread cookie or cake. While the abundance of spices may be warm and familiar, many interpretations add a lot of pomp and circumstance in the form of dried or candied fruit. Since I’m not a fan of cloyingly sweet baked goods, I have much more of an affinity for the older, traditional recipes that seem to hover between sweet and savory. In the recipe I’ve created, a little brightness from citrus keeps the bread from being one-dimensional and heavy, complementing the aromatics from both the spice blend and the flours. It is equally delicious eaten by the slice or served with a winter fruit compote as it is toasted, accompanied by cheese and nuts. Rye and Whole Grain Red Wheat flours are very traditional in pain d’epices – my personal favorite for the red wheat here is Rouge de Bordeaux or Red Fife. These heritage wheat varieties have an extra dimension of nuttiness and aromatics that work hand in glove with the winter spices. If you have Spelt, some Hard White or a different Hard Red on hand, they would be fine alternatives to the heritage grain. If you can’t easily source Long Pepper, no worries. A couple of grinds of fresh pepper will keep things interesting and add that exotic je ne sais quoi. If you can find buckwheat honey, it is historically accurate to use in this recipe – and delicious! I prefer baking quickbread in an 8×4 pullman pan, no lid. Shorten the bake time if you’ll be using a regular loaf pan. Your pain d’epices won’t be as tall, but resting the batter-filled pan in the refrigerator while your oven heats up, 30 min to 1 hr, can help promote a lovely domed top. Preheat oven to 350˚F. Butter or spray an 8×4” loaf pan. Set aside. Gently heat milk and honey with spices to a simmer, remove from heat, add butter and let steep and cool slightly. In a large bowl combine Rye, Whole Grain flour, baking powder and salt and whisk well to combine. In a separate bowl, whisk eggs with marmalade and orange zest then whisk in cooled milk mixture. Add liquids to dry, mixing just to combine. Pour into prepared loaf pan and sprinkle top with demerara or sanding sugar. Bake for about 50 minutes, or until tester comes out clean. *If you are using a regular 8×5 or 9×5 bread pan, start checking after 40 minutes. Allow to cool in the pan for at least 10 minutes. Remove bread from pan and cool completely on rack.